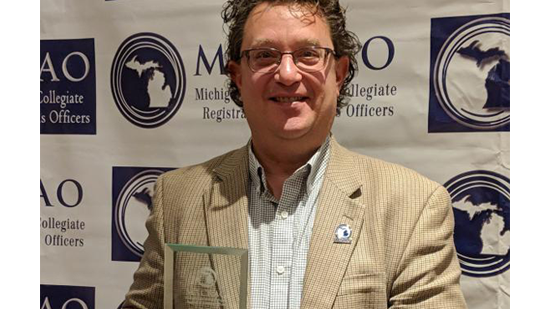 Northern Michigan University’s bachelor of science degree in applied workplace leadership received the 2018 Innovation in Transfer Award today at the Michigan Association of Collegiate Registrars and Admissions Officers (MACRAO) annual conference in Frankenmuth. The online program enables individuals holding an associate of applied science degree from any community college to ladder to a bachelor’s degree that will qualify them for management positions. The MACRAO Innovation in Transfer Award recognizes practices that improve the ability of an institution to serve transfer students. Joe Lubig, director of the School of Education, Leadership and Public Service, developed NMU’s program in consultation with Registrar Kim Rotundo. The program launched in fall 2017. The five core courses address effective communication, ethical leadership, assessment, systems thinking, and leadership in diverse workplaces. Assignments are applicable to real-world situations and include identifying problems in a workplace and proposing solutions. NMU developed the curriculum in collaboration with community partners that included Michigan Economic Development Corporation, Michigan Works!, the Upper Peninsula Construction Council, Bay College and UP Health System. “The new academic major leverages courses designed around specific employer input and needs, allowing students to develop an applied skill set for implementation in workplace settings,” Lubig said. “And the online delivery through NMU’s Global Campus allows working professionals and distance students to complete their degree while attending to their current work obligations. There are 36 students majoring in applied workplace leadership. Lubig said students from other majors are recognizing the value of the content, so there are 60-70 students enrolled in each core course. Lubig accepted the award on behalf of NMU. He and Rotundo also gave a presentation on the program.